An easier way to make spaetzle is by forcing the dough through a colander or grater with large holes, but there are also several devices that make spaetzle making even easier. One, a spaetzle press, works like a potato ricer. Then there is the hopper type spaetzle maker (this is what I have ). A flat piece of metal with big holes fits across the pot of boiling water… the hopper is filled with a thick batter, and as it is moved back and forth across the metal piece, the batter is forced down through the holes into the water. It’s a very, very quick process. I have mixed this batter in my food processor, and that works well except the batter is so thick and elastic, it is rather an ordeal to scrape it out of the small processor bowl. Usually I mix the batter in a large bowl using my stand mixer… it is much quicker to scrape the dough out of the mixer bowl’s larger open space. I beat the eggs until they are frothy, add the milk and the dry ingredients, and beat until the batter is smooth and elastic. That happens very quickly. I already have a tall pot of water boiling and ready on the stove, so I just place the spaetzle maker across the pot, scrape the batter into the hopper, and slide the hopper back and forth until all the batter has been forced through the holes. The spaetzle are done when they rise to the top of the water… they take about three minutes to cook. 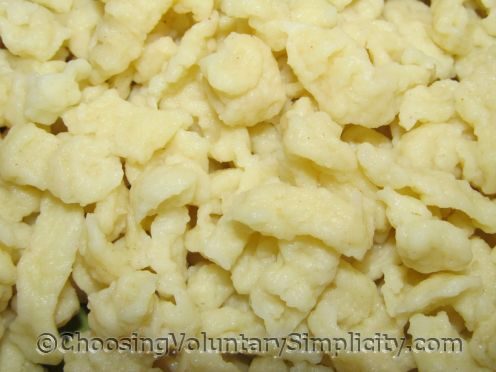 I can mix up a batch of spaetzle and have it cooked and ready to eat in less than ten minutes… which makes spaetzle a wonderful “fast food” alternative for those of us who have to make everything we eat from scratch. Thank you for this. I’ve always wanted to make spaetzle but didn’t have much luck with the traditional method. I didn’t realize the spaetzle makers made it all so easy. You have inspired me to try this because it sounds so easy and something I can do. I’m trying to expand what our soy free family can eat and these spatezle look delicious. I’m thinking I will substitute these for pasta. I have loved spaetzel ever since I had it in a Swanson’s TV dinner, back in the 60’s. Of course, I tried it, a first opp, in a German restaurant, and never went back to the Swanson’s version. For some 40 years, I tried to make it with all the different techniques, from scraping off the board, to pushing it through a collander, with mixed success (mostly disasters). Finally, two years ago, I decided to get the little tool pictured above. It works marvelously and I wish I had acquired it 30 years ago. Do you know if this is different than home made egg noodles (or frozen)? Is it just the lack of the drying process? Do they taste any different or have a different texture? I used to help my grandma make egg noodles. Other than the addition of nutmeg, the receipe is proportionally the same as Grandma’s. We mixed the dough and then rolled it out to 1/4 of an inch. Then floured the dough before rolling into a long roll. Then we cut the roll into 1/4 inch slices to make long wide strands when unrolled. Then we cut those into noodle sized pieces and let them dry on a floured sheet on the table until the next day to be used in chicken noodles. Some people in different parts of the country call those dumplings, but grandma also makes what we know as dumplings which is like a quick rise dough that is dropped by spoonfuls into boiling liquids to make a chicken and dumplings or apple dumplings. I think grandma makes dumplings when she didn’t have time to make egg noodles. This seems like maybe a mix of the two. I have never known how to say that word…thanks!! This sounds like what my mother would make, except she would roll it out on a floored board and cut it into squares. Then she would put them into soup or stew. She would call it ‘pot-pie’ which we children turned into ‘popeye’. I will have to try this recipe and see if it is similar because I loved that stuff, but my mother took all her recipes to her grave. She cooked from scratch and used very few, if any, written recipes. All I know is that that recipe makes a LOT of spaetzle! I need one of those tools. Last time I made it, promised myself I would never do it, again! But, now, I have hope. I enjoy it fresh from the pot of boilingwater and also fried, the next day. Oh thank you, my grandmother made these and I was dumb enough to not learn how to do it before she passed. I’ll be making ASAP! Thank you — thank you! My mom would make these for my brother and I growing up — she’d boil and then brown in butter. OH MY! Yum!! My husband makes this as you described on a board. It is a traditional Hungarian recipe thasts he puts into papkika chicken. It is extremely popular in our house and is often requested whenever one of the children are visiting home. He calls it nokedley. No idea on how its spelt.